We left Cooktown this morning and began a slow meander to Cape Tribulation, with plenty of stops on the way. Our pack up this morning was a disaster and took almost two hours. If we are all organised and motivated, we can be on the road within 20 minutes of waking up. However, on mornings when we are all feeling sluggish it can feel like it takes most of the day. This morning was one of those days. Jazzy and Isabelle had decided to sleep in the same bed together the night before, as Isabelle has been having bad dreams. I had strong suspicions that it would be a disaster but went along with the plan as there are far too many killjoys in our family already and I relish in my position as the family “fun rule breaker”. My suspicions were correct. It was a disaster. Jazzy kicked Isabelle out of bed at about 11:30pm and then Isabelle proceeded to cry loudly and intermittently for the rest of the night. I’m sure the neighbours that were sandwiched in beside us at the Big 4 could hear every single thing. From Isabelles crying to Ben & Kylah’s swearing (Kylah didn’t technically swear as she does not break rules. But she said things like “oh for fudges sake!” which is pretty darn close) and me singing a very bad rendition of a Carpenters song that goes “Why do birds suddenly appear, every time, you are near… just like me, they long to be close to you” to Isabelle to try to soothe/torture her to sleep. To escape my singing, Ben took himself off to the toilet sometime after midnight, muttering under his breath about how if we were in a national park he would be able to pee on a nearby tree instead of trudging 300m to a toilet block. He was gone for a while and in that time I had managed to get Isabelle back to sleep with my singing. On his return from the toilets however he excitedly woke up all the children and forced them out of bed to accompany him back to the bathroom to see a 3 metre python. I wasn’t invited on the snake viewing expedition and was very thankful that I was not as I find it difficult to come up with excuses in the middle of the night. All of my pre-memorised, middle of the night excuses do not relate to snake viewings. As a result of the midnight shenanigans, pack up was a long, whingy, noisy and arduous task peppered with bouts of inconsolable crying and under breath swearing. Nonetheless we were on the road by about 10am. Everyone had perked as we pulled into our first stop, Black Mountain, which was not far out of Cooktown. 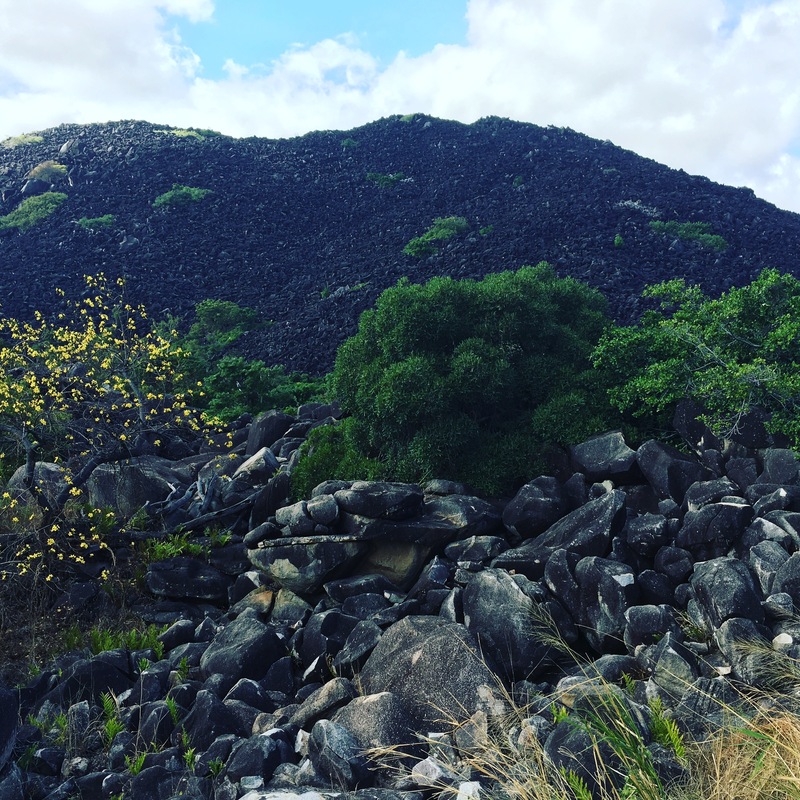 Black Mountain is a huge mountain that is covered in black rocks, some tiny, some the size of huge boulders. I was keen to find out how this mountain formed and the kids were keen to climb all over the rocks. The mountain was formed about 260 million years ago and was originally a mass of molten magma that cooled to be hard granite. Then something happened (I can’t remember what happened) leading to stress fractures that water penetrated. After that there was something about clay somewhere/somehow that eroded away leaving a mountain of boulders/rocks. 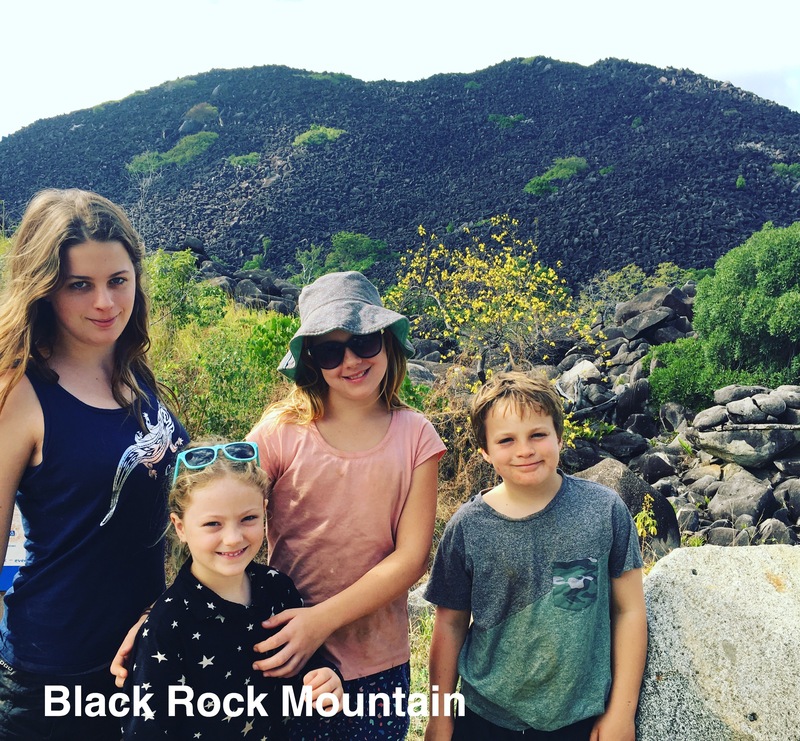 Kids clamoured all over the nearby rocks, not going too far as people are not permitted in the Black Mountain National Park. According to local legend, there is a Qld tiger that lives in Black Mountain and there have been many mountaineers that have gone missing whilst attempting to explore the area. Kids posed for a series of photos and we moved on to our next destination. 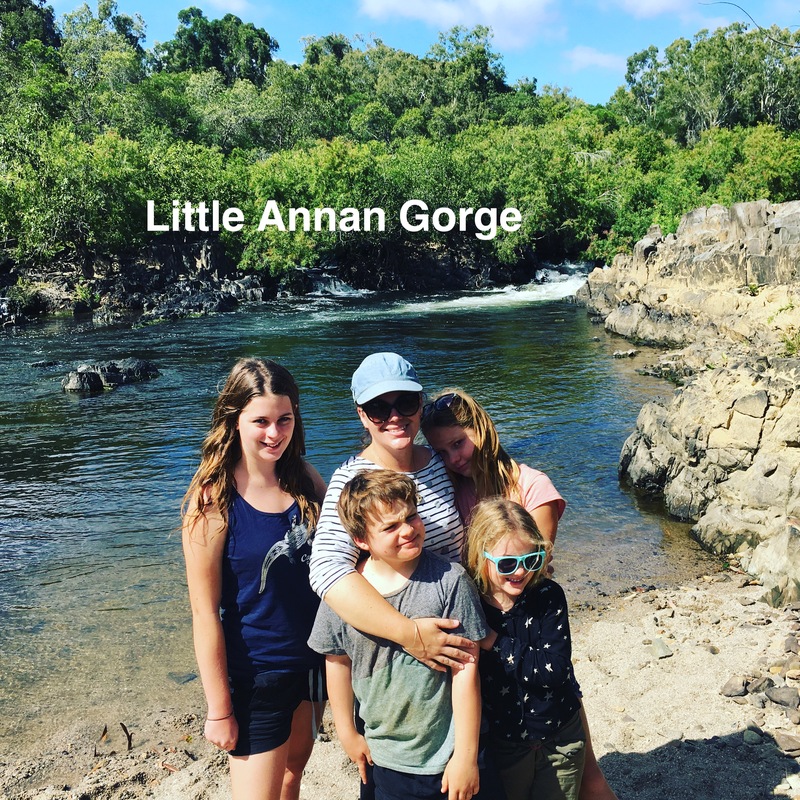 Next stop was Little Annan Gorge for a bit of a sticky beak. It was quite beautiful and would have been the perfect spot for a quick dip, but we were behind schedule so merely snapped a few photos before continuing on. Lions Den Hotel was third on our list of places to visit. It is a bit of a legend in the area and has a real Aussie Outback Vibe to it. People have scrawled messages all over every bit of wall in the place and they have a little museum attached where you can look at period bits and bobs. After wandering around the place for a little while Ben decided he needed a coffee, his first one on this trip. By this stage it was about 11:30 so I thought that I’d buy some hot chips for the kids, save me making them eat tinned tuna for lunch – again. Rohan accompanied me up to the counter while I ordered and the lady serving told me that they do not start cooking lunches till after 12. Tears sprung up in Rohan’s eyes (we had missed morning tea so he was starving). The waitress quickly told him that they sell pizzas before 12 in order to cheer him up. He asked “Do they have cheese on them?” in a quivering voice. I suspect that the waitress probably assumed he liked cheese because she answered with “Yes. LOTS of cheese!” At this poor Rohan’s tears turned into choked out sobs. Pushing him aside I ordered a pizza for everyone bar Rohan to share, and Ben’s coffee. Rohan continued to bawl for the next 10 minutes until the poor bewildered waitress bought the pizza out, then his bawling turned into howling. I guess she must have felt bad because she soon returned with chips for him. Tears dried up instantly. Next on the agenda was the start of the Bloomfield track, which would take us to our destination – Cape Tribulation. The track is not too bad. It’s a very hilly and windy track with a few creek crossings. We stopped off to check out Bloomfield Falls, which were majestic and powerful. Pity they are filled with salt water Crocodiles because they would have been an awesome spot for a swim. We arrived at our campsite, Noah Beach, at about 4pm and it’s a magical spot. We are back to National Park camping, much to Ben’s delight, and are camped right in the rainforest about 100m away from the beach. Our position allows us to be able to enjoy the smells and cool temperatures of a rainforest as well as the soothing sound of waves lapping the beach. Very tranquil. We ended our day with a nice walk along the beach. Kids had heard through the grapevine (I told them) that Cape Tribulation has an ice-cream factory so they challenged Ben to another race on the beach. If they won then they got to go to the ice-cream factory and if he won they didn’t. He won. Surprisingly there were no tears. I think the kids were quietly confident that somehow I would ensure the ice-cream factory was toured before we departed Cape Trib. Dinner was salad, which everyone LOVED after weeks of eating stews and curries. Tomorrow Ben, Jazzy and Rohan are going to climb Mt Sorrow. The reviews of people who’ve climbed it say that it is a treacherous, steep climb filled with leeches and mozzies. Sounds to me like the Mountain is aptly named. I quickly nominated myself to stay back with Kylah (who did not want to go) and Isabelle (who I declared too young to go out of fear that if she went, Ben would need another adult to accompany him with so many children). I’m super excited about my quiet morning with half of our party out hiking. Lucky me!!!! Sounds like a lot of fun u r all having. The idea of a warm spot near the beach sounds divine. We r having frosts, which I don’t mind on weekends but r torture in work days. Keep the blogs coming. I really enjoy them. I read them before I go to sleep. When other night I actually dreamt that u and Jazzy got sick and flee home. I had to reread ur blog to make sure it was a dream. Lol. Thanks Renee!! There have been times when I’ve wished I was sick enough to be shipped out to a place absent of red dirt.